5951 ∆ 94DZ 10 Pfg. 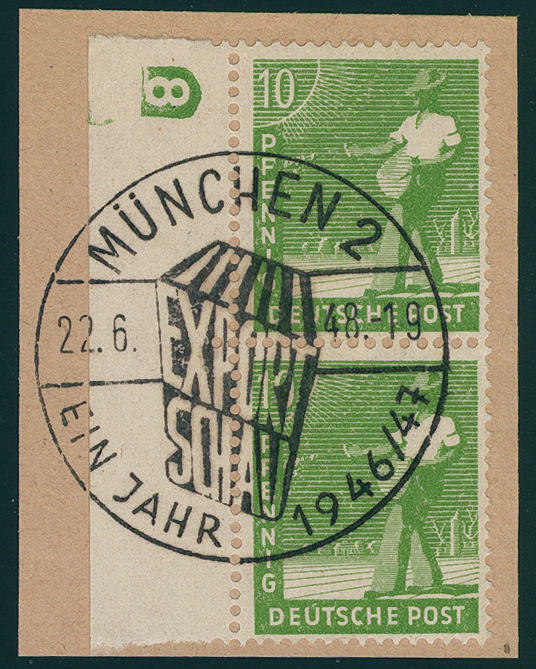 Worker, vertical pair from left margin with printer sign \"8 (negative) \", fresh colors and in perfect condition on very nice letter piece with all perfect special cancellation \"Munich 22.6.48\". A piece of dream! 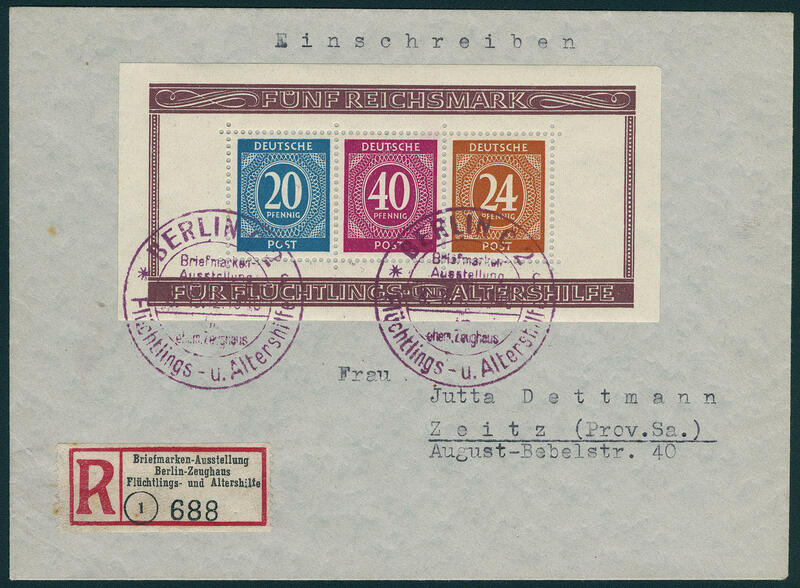 5952 ✉ Bl.12A/B Help for the aged souvenir sheet pair 1946, always as correctly franked single franking on two very nice registered covers with violet special cancellation \"BERLIN\" with special registration note to Zeitz with arrival postmark. Photo expertize Schlegel BPP. 5953 936Abart 84 Pfg. 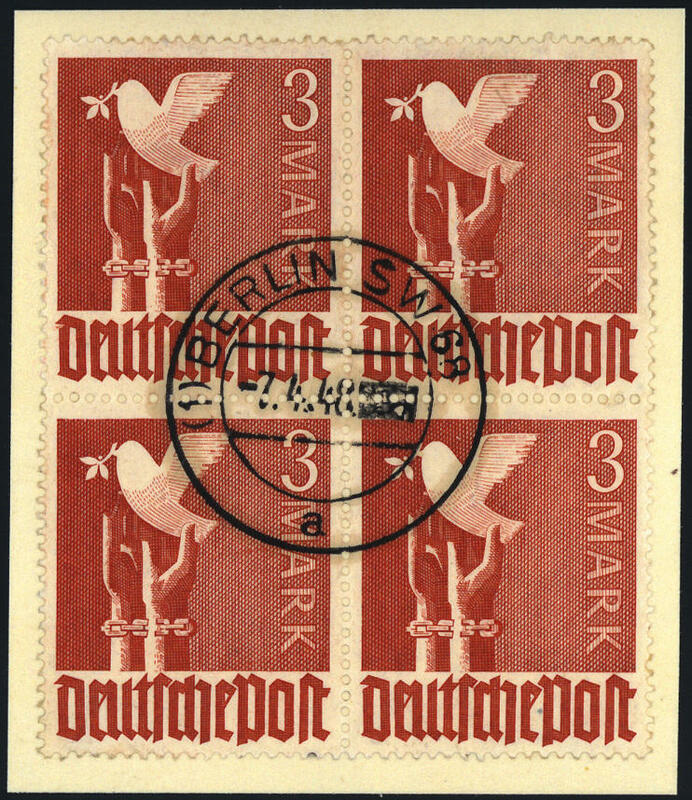 Numeral, block of four with enormous upper margin, through it are beyond the rows value numbers also the row numbers available, unfolded and in perfect condition mint never hinged scarce variety! 5954 941IU 24 Pfg. 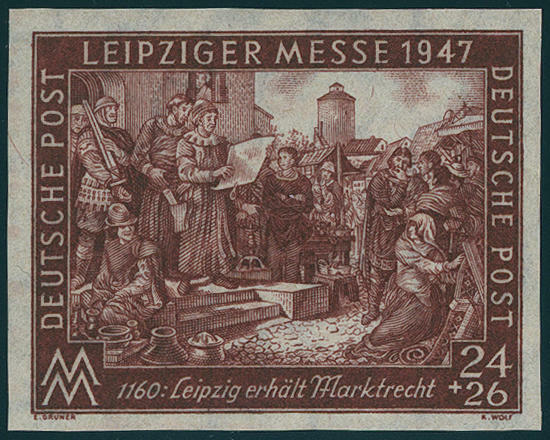 Leipzig fair four sides unperforated, in perfect condition mint never hinged a very scarce variety! Expertized Richter. 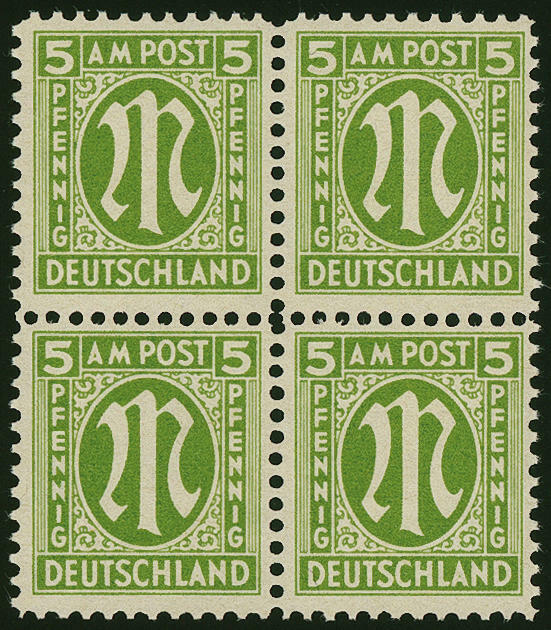 5955 FDC 943/58 2 - 84 Pfg. 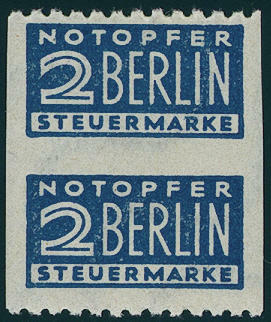 Worker, all 17 values complete on two faultless first day letters with the corresponding first day cancel`s \"Hamburg 1.2.48\" respectively \"BERLIN 1.3.47\". In this completeness hardly ever offered! 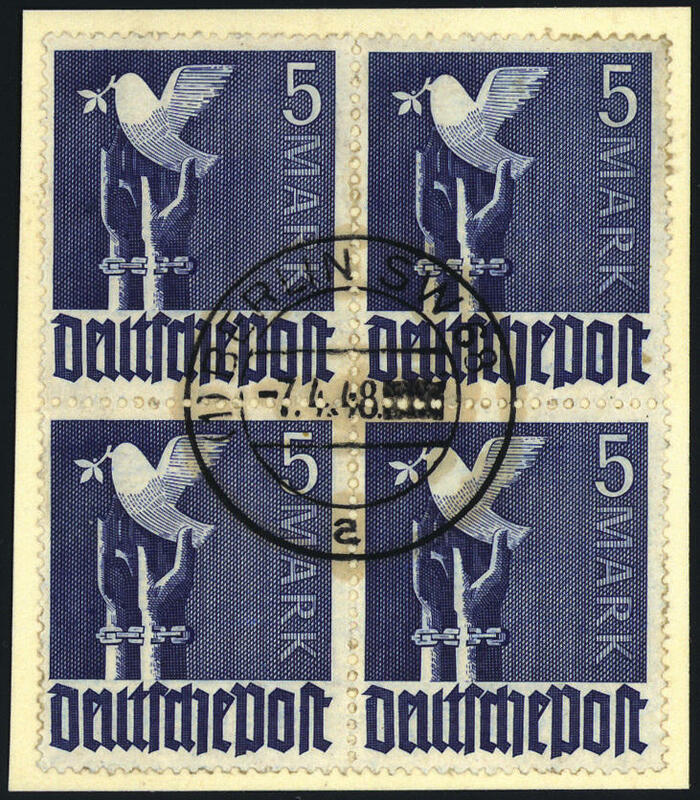 5956 ∆ 943/62 Worker and peace pigeon, the complete set from 20 values in blocks of four, 60 Pfg. 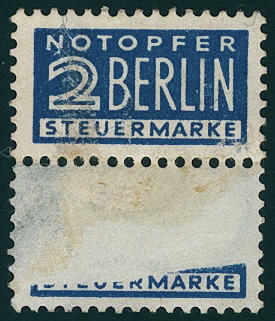 In dark colour, on lovely letter pieces, uniform perfect centric cancellation \"BERLIN 7.4.48\". Extraordinarily scarce lovers series! 5957 ✉ 947U 12 Pfg. 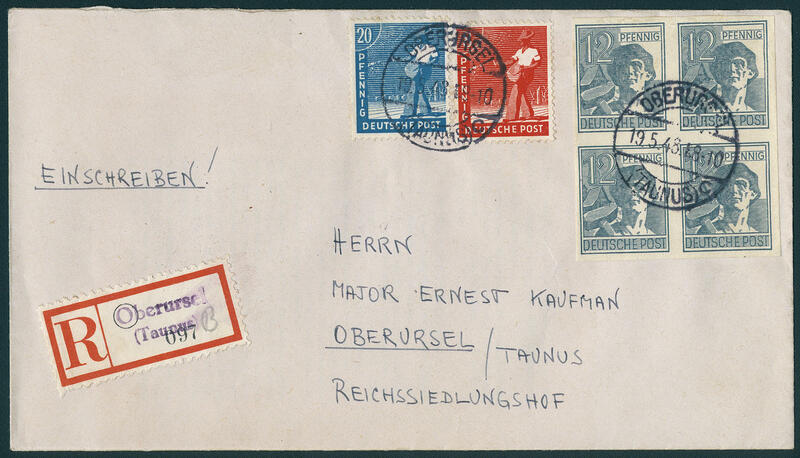 Worker unperforated block of four, the two of them upper stamps minimal practically insignificant buckling, as far as in perfect condition with additional franking on very nice, correctly franked registered cover from \"OBERURSEL 19.5.48. \" in the local usage used. Already lots used is these variety rare. 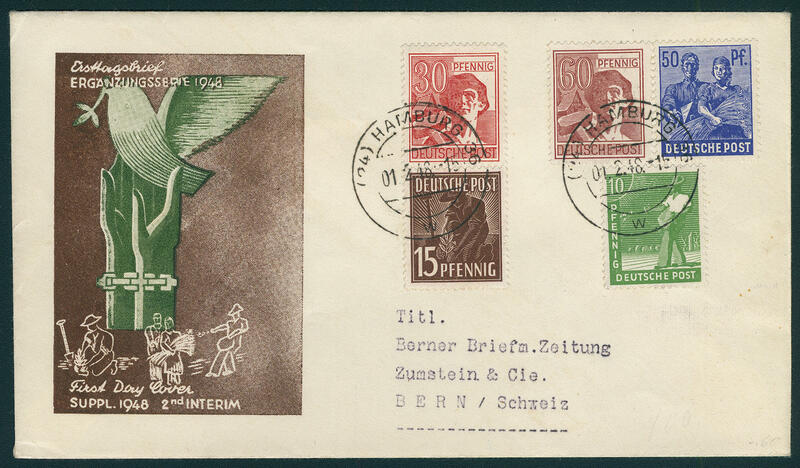 As block of four on cover a rarity the allied occupation! Photo expertize Hans-Dieter Schlegel BPP. 5958 ✉ 959b 1 Mk. 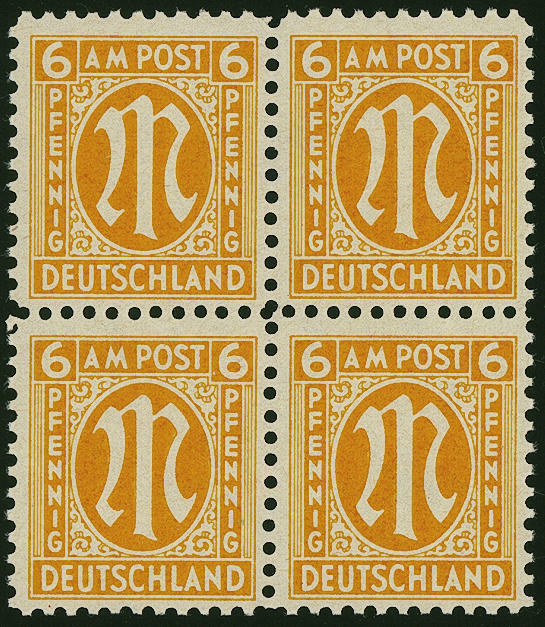 Black gray yellow (strong fluorescing), the so-called \"golden dove\", in perfect condition with additional franking on correctly franked registered local letter as tenfold franking from \"HALLE 25.6.48\" with arrival postmark. 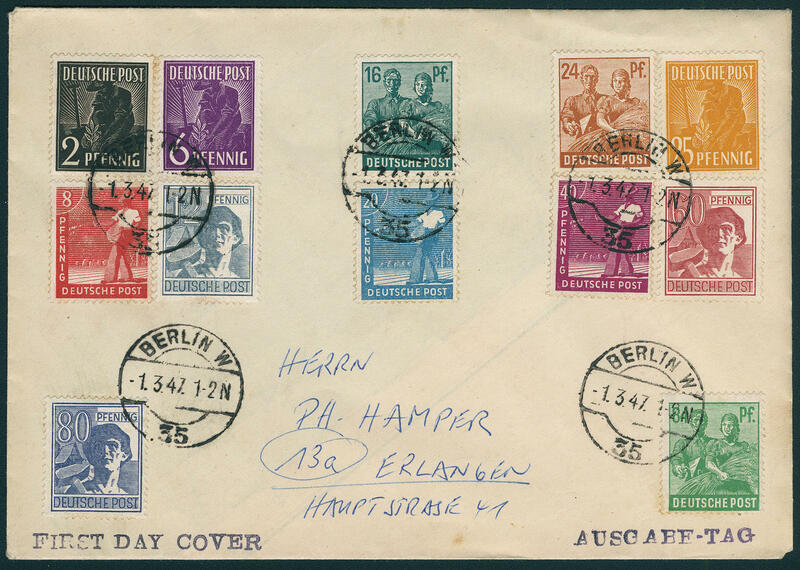 Covers with of this issue are very rare! Twice signed Schlegel BPP. 5959 964U 75 Pfg. 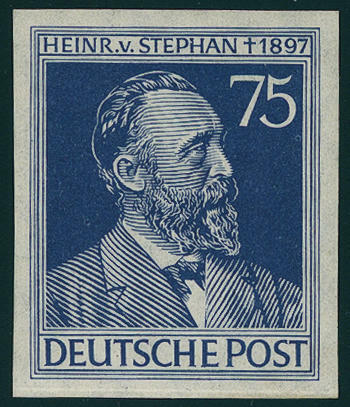 Stephan 1947, four sides with wide margins unperforated, fresh colors and in perfect condition mint never hinged, a scarce variety, expertized Schlegel BPP. 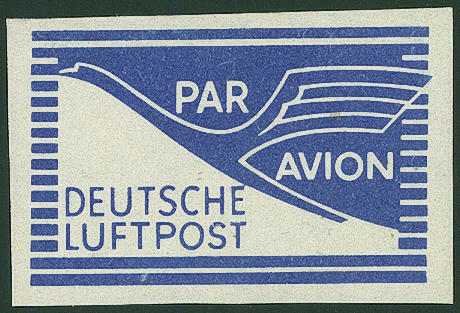 6785 1KU JEIA airmail admission stamp 1948, the spectacular unperforated horizontal tête-bêche pair, fresh colors, large margins all around, a value kink, otherwise in perfect condition mint never hinged there are only few examples from this known, the to the rarities of the German postwar Philately count. Due to missing offers also in the Michel special catalogue only noted without price! Photo expertize Schlegel BPP. 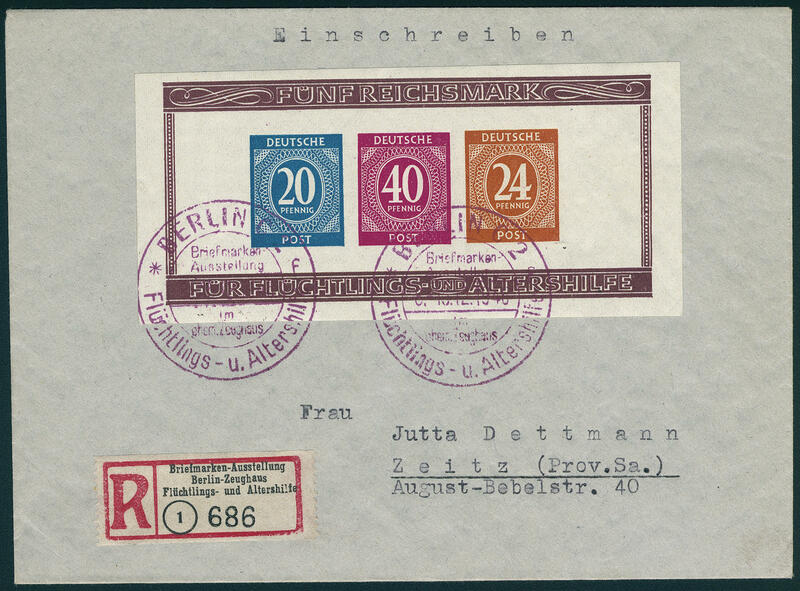 6786 1U JEIA admission stamp, four sides with wide margins unperforated, fresh colors and in perfect condition mint never hinged a very scarce variety, the only in few copies have become known is! 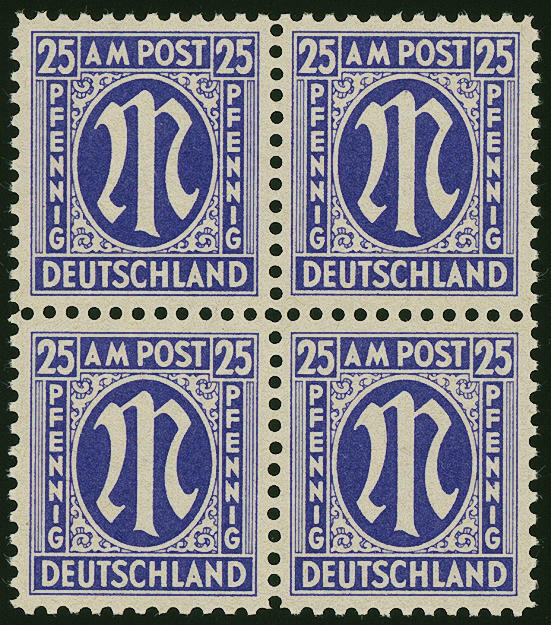 6782 2 2 Pfg. 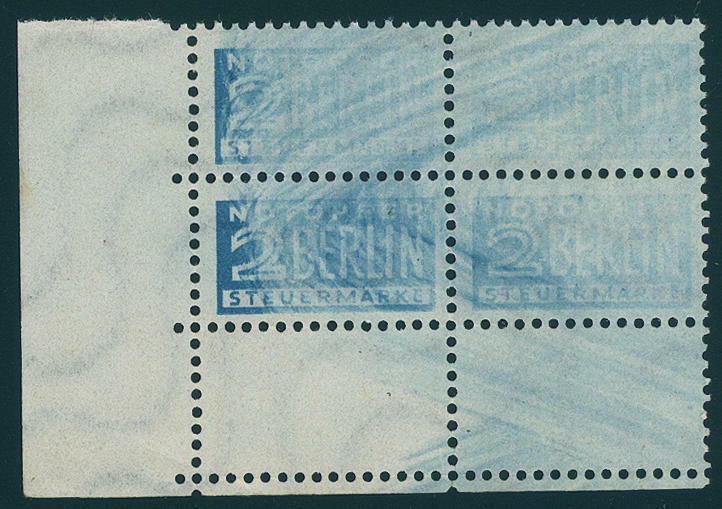 Help for the Needy, block of four from the left lower corner of the sheet watermarked 3 X and two attached blank fields, at the bottom minimal separated, in perfect condition mint never hinged it is a matter herewith about a very weakly colored, blurred spoilage printing. In this kind very exceptional and rare! 6783 2BAZ/BBZUdr 2 Pfg. Help for the Needy in the vertical pair, both vertical, as also in the middle unperforated, fresh colors and in perfect condition mint never hinged a decorative and rare combination pair the both varieties! Photo expertize \"mint never hinged perfect\" Harlos BPP. 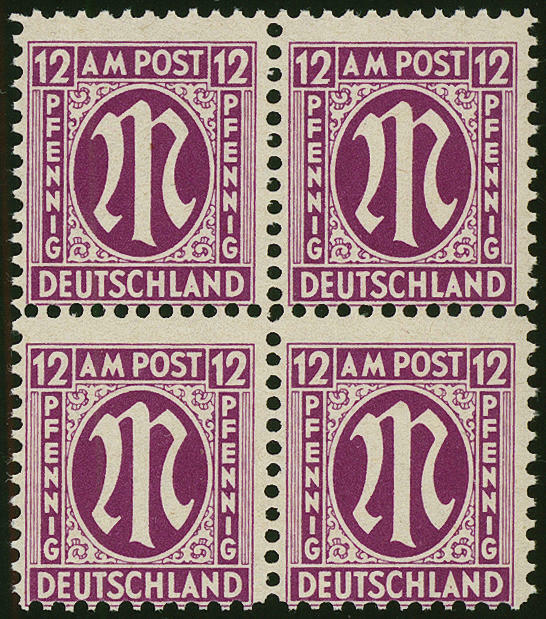 6784 3Pa 2 Pfg. Help for the Needy, vertical pair with very rare variety \"glued paper web\". After the printing is the lower end the adhesive patch lost and lets now an unprinted place and the adhesive patches recognize. According to photo expertize it concerns an herewith about one of the very few condition remained mint never hinged pieces. This carries the as usual repair tracks, the in of the printing plant Wegener induced were. A help for the Needy rarity! Photo expertize Friedrich Harlos BPP. 6687 18/24,28PII 4-25 Pfg. 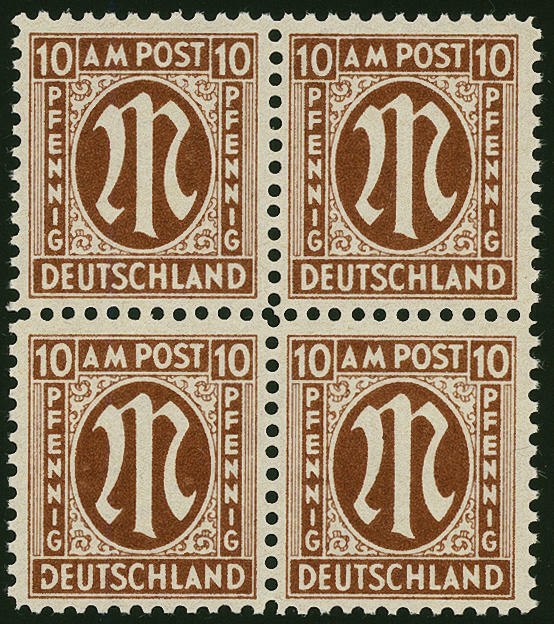 First issue of stamps for Germany after WW II., all eight different trial proofs on paper x, perforated L11, in blocks of four, fresh colors and very well perforated, unfolded, without any signs, in perfect condition mint never hinged a spectacular set for the advanced special collection! Photo expertize \"the condition is perfect\" Schlegel BPP. Michel 6700,- €. 6688 21Azr3 8 Pfg. 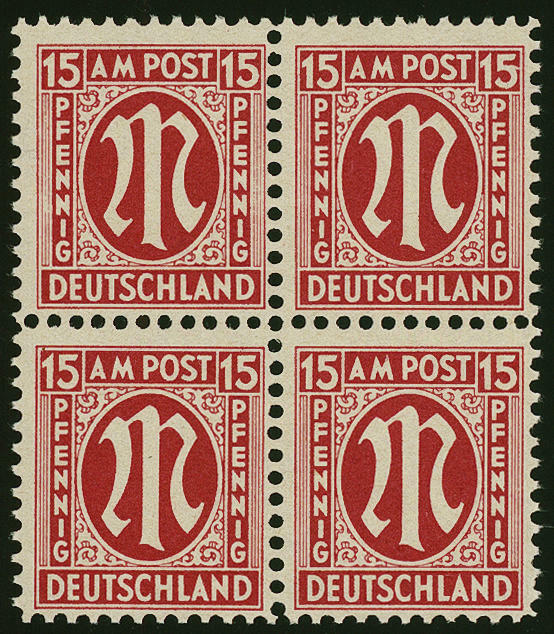 First issue of stamps for Germany after WW II., block of four from of the right upper corner of the sheet with rare three-figure sheet counting number \"561\" in red, fresh colors, unfolded and in perfect condition mint never hinged, without any signs. Very rare! Michel 800,- €. 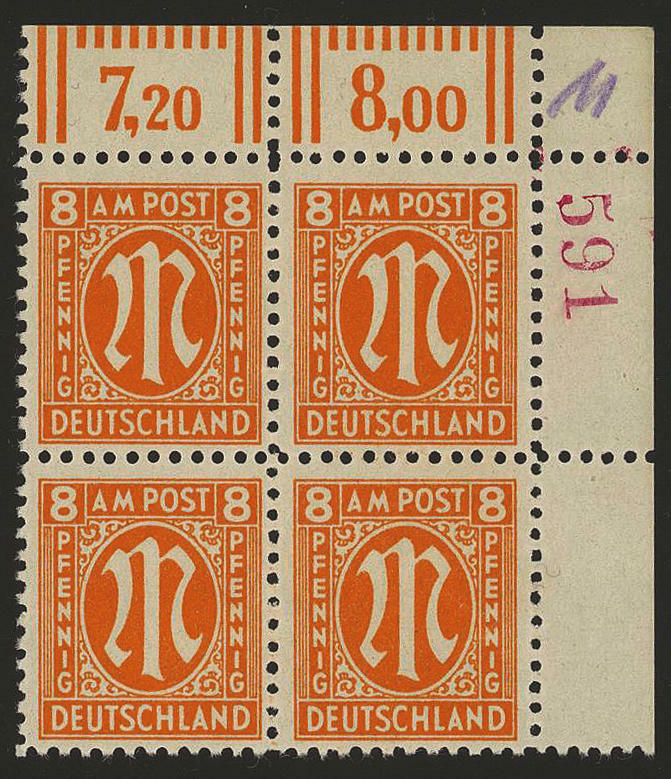 6689 22Dz 10 Pfg. 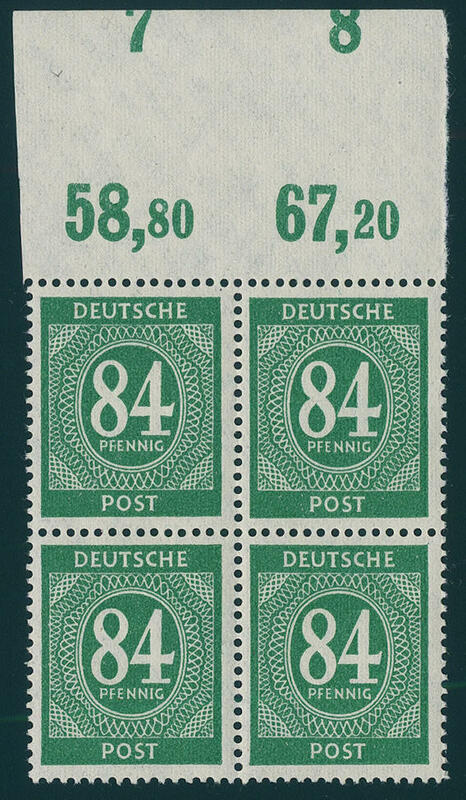 First issue of stamps for Germany after WW II., paper z, perforated L 11 1 / 2, having bright colors block of four from right margin of sheet, in perfect condition mint never hinged, photo expertize \"the quality is perfect\" Wehner BPP. Michel 1800,- €. 6690 ∆ 24PIVU 15 Pfg. 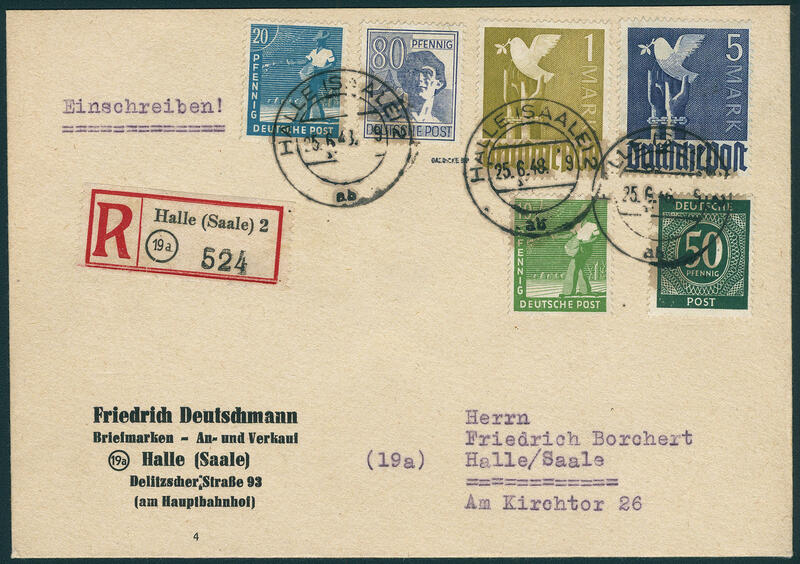 First issue of stamps for Germany after WW II., German printing, spectacular unperforated proof in the vertical pair, very fine centric cancellation \"WOLFENBÜTTEL 23.5.46. \". 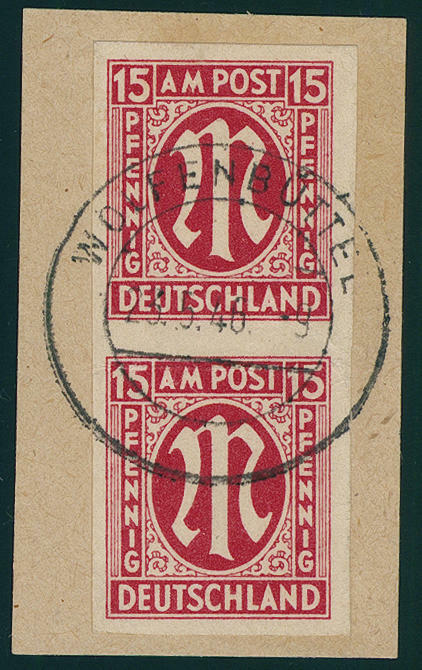 Already mint never hinged trial proofs are extraordinarily rare. In this kind one of the large rarities of this area! Photo expertize Schlegel BPP. 6691 34bCz 80 Pfg. 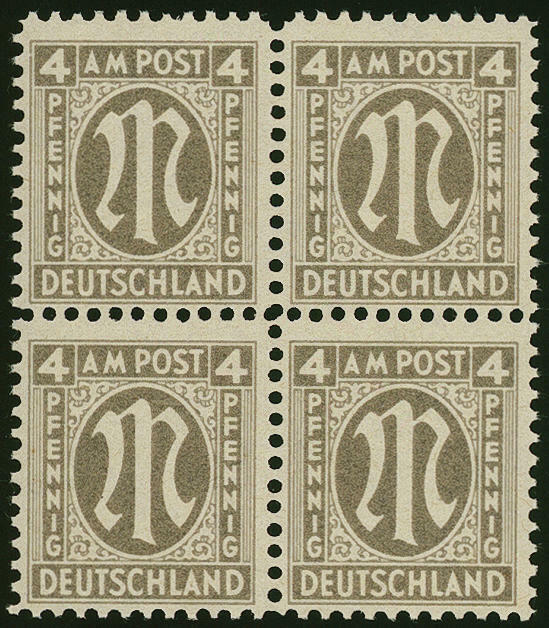 First issue of stamps for Germany after WW II., horizontal strip of four from left margin of sheet, horizontal perforated 11 1 / 2, vertical is the perforation unusual, whereby the perforation needles the paper still touched, without the holes punch out. 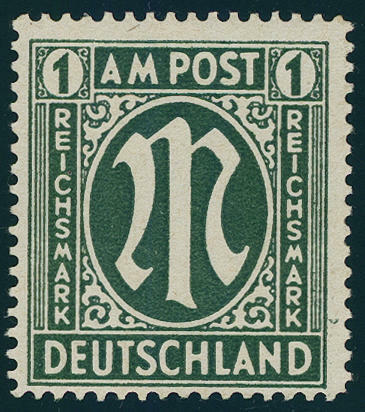 An attractive and scarce variety! Photo expertize \"the condition is perfect\" Andrew Schlegel BPP. 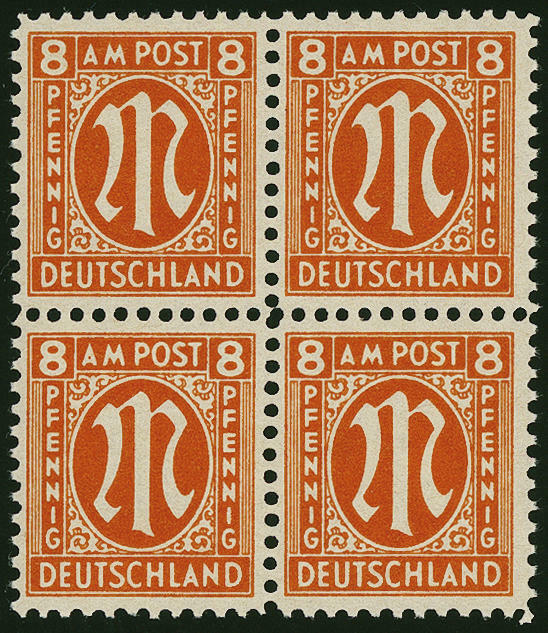 6692 35FÄ 1 Mk. 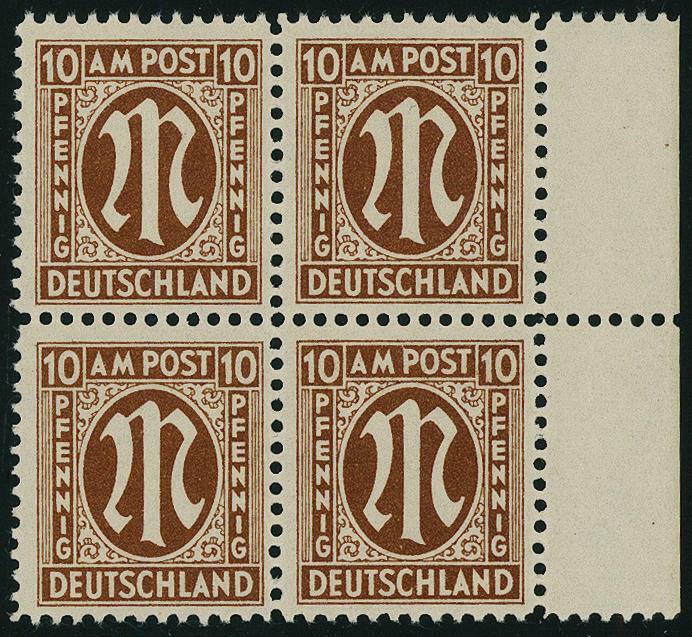 First issue of stamps for Germany after WW II., so-called Thobe-forgery, in perfect condition mint never hinged (see Michel special catalogue page 867).